Now I'll explain the design. I like the Papua-New Guinea flags for some typical characteristics (so I decided to keep it): diagonal divisions, colorfulness, presence of local fauna and flora. Also, I tried to create a flag that didn't resemble Western Highlands flag. In first division, you can see a bird-of-paradise, the symbol bird of the country. The blue color is reference to regional climate, relatively cold to the tropics (sometimes, it snows). The second division is red, with white fimbriation. The color is reference to biggest economic activities in new province: coffee farming, followed by tea cultivation. 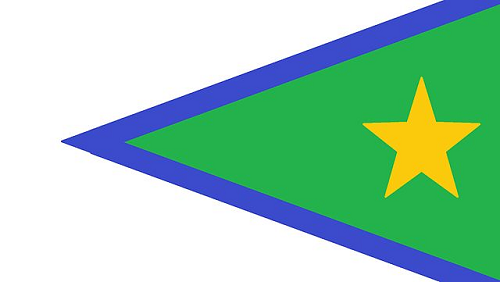 The last divisions has three stars, representing the three districts (Jimi, North Waghi, Anglicamp-South Waghi) in a green background, symbolizing the color of Mount Wilhelm, biggest mountain in the islands. I searched a lot, but couldn't find a lot of information about the new province. So, this flag is a bit generic, I have to admit. Your comment is welcome. You're free to praise, criticize, ask or suggest. There's still time to participate: click here to take part in commemorative post. Everybody can participate! 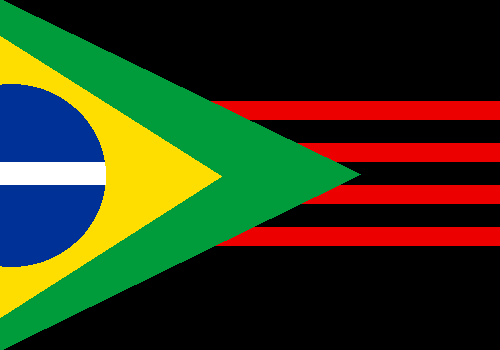 It's a commonplace in Brazilian city flags: a very traditional shape (three stripes) with a coat of arms. 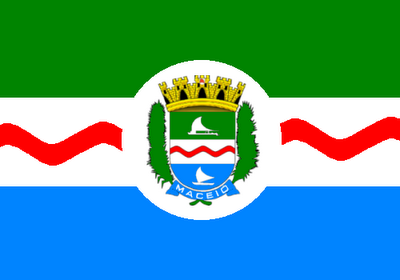 At least, Maceió coat of arms is beautiful. But everybody can perceive that the coat of arms is repeated twice: in the background and in the shield. So, let's improve it. 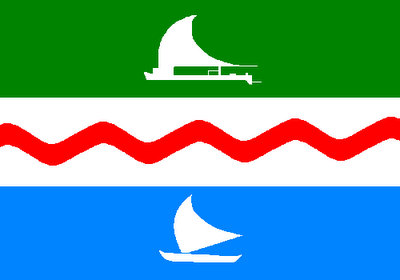 It looks simple, original and still resembles the city coat of arms. This is it! I would like to know your opinion about this post. Write a comment, please. Soon, I'll return to São Paulo, so I'll post some prepared content. Now I'll return with the REVIEW section of this blog, that was a little absent. In this section, I make a review of a flag proposal by somebody else. Today I'll comment the main flags of Brazilian proposed states. 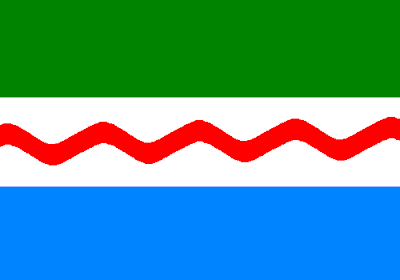 Tapajós: I'll start with the flag that, for me, is the most beautiful. It's used by Tapajós, a proposed states comprising the Pará west, considered "forgotten" by state authorities. This flag was very used in a campaign before a state secession referendum last year (2011), but people voted against the separation. 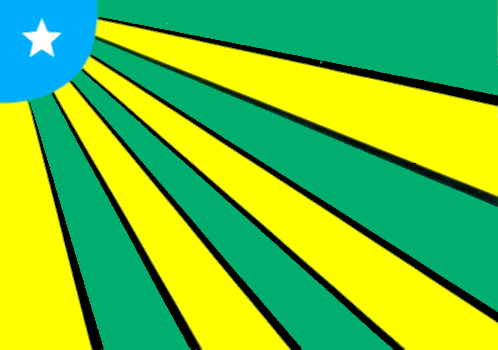 The explanation of the flag: the yellow stripe is for Amazon River richness, compared with gold, the blue is for Tapajós River, that names the proposed state, and green for the forest. Carajás: The same referendum that voted Tapajós secession also voted Carajás secession, also failed. Carajás is a proposed states in southeast Pará, in an area comprising some of bigger open-air iron mines, but with small federal and state investment. The flag remember the sunshine, but I don't like it. I don't know what I dislike more: if the small circle or the fimbriation in black. 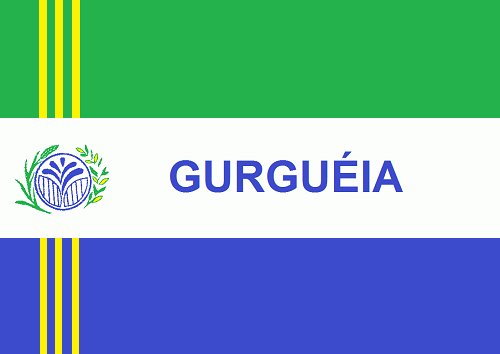 Gurgueia (old ortography = Gurguéia): It's a proposed state in south Piauí, one of poorest regions in country. The proposal is in voting process in Brazilian Parlament. I don't like too much the flag, because it's very polluted. Maybe without the writing and with a bigger central stripe and symbol it would look better. Triângulo: It's used by a proposal of new state comprising Minas Gerais region of Triângulo Mineiro ("Minas Triangle", named because its shape), with a supposedly different identity: the region was part of São Paulo and Goiás in the past, and is economically very related with them. It was, probably, one of two most "viable" proposed states. I like the flag, specially the triangle, that names the state. There's more or less twenty federal law projects related with proposed states, but many of them hasn't a known flag. I'll travel next week, and the time to the blog was low, but I tried to write a fast and interesting post. I'd like your feedback on comments area. It's important to help the blog get better. We passed the 1,000 views (I'm late, actually we passed the 1,100 views, too), VERY THANKS, but you can vote on commemorative post yet. It's fun and fast, I recommend you to click on link. 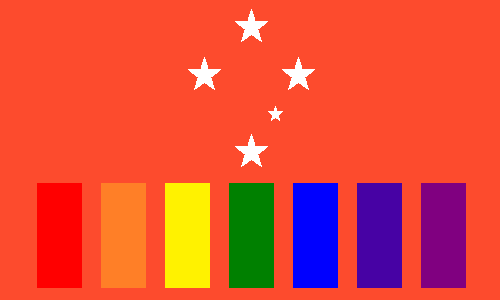 I tried to put it on a more professional software, making a rainbow gradient, but it isn't a good technique to a flag: possible to do in digital print (although costs much toner), but not in manual needlework. So I decided to put the seven colors separately. I know that the Great Barrier Reef is on Queensland jurisdiction, but I imagine it's visible from the islands. The background color is coral — a pun with islands name. 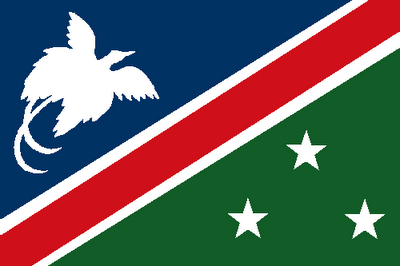 The flag contains a Southern Cross; if the islands were disputed with other some country, a more "Australian" symbol (like Australian coat of arms) should be needed, but as it doesn't occur, I think it's a very adequate symbol. 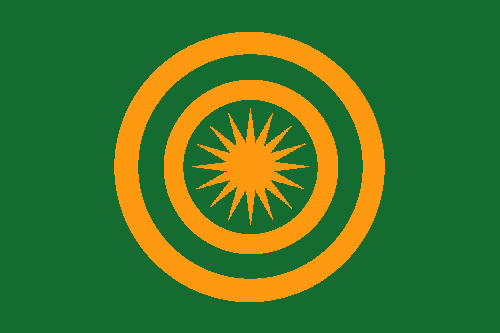 It's not a very serious flag, but I'd like very much to receive comments. Only 23 views to complete a thousand. It's very near! I don't know if somebody is interested, but I'm creating a blog about sportive mock-up (it's incredibly common here in Brazil). The language is Portuguese, but if you have courage to face an automatic translation, the URL is this: http://gaya-mockups.blogspot.com.br/. The blog is about six months on air, and we're very near the 1,000th view. To commemorate it, I'm proposing an special activity: suggest a subject (any subject!) and I'll present a flag proposal to it. Comments are open for a month: until August 7, 2012. As soon the suggestion are given, I'll post the answers! I'm counting with your participation, and, for now, I thank everybody for make the blog grow with your audience! July is vacation month in Brazil, and I'm using a little free time to make some flags. The today's flag is actually a big improvement of a flag I firstly thought to publish in this blog, but on which I wasn't aesthetically secure. It was a flag to represent the native Brazilian people. Why a flag? In some countries at Americas, like USA and Canada, almost every single tribe has they own flag, and, if you think, it's a bit exaggerated. In Brazil, I can't remember any flag to any native group. How would take time to create a flag to any one of them, I first created a flag whose representation comprise all the native Brazilian. 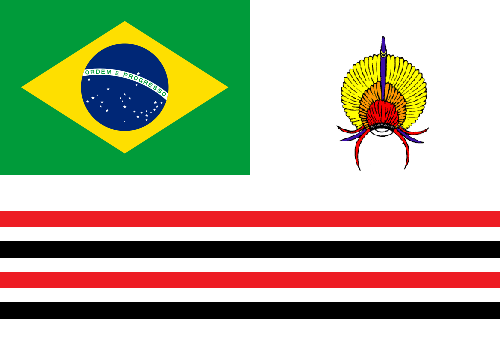 Brazilian flag at canton (it was my creation, I can't remind any flag using it), an war bonnet — took from FUNAI (National Institution to the Indian) logo — and four red and black alternate stripes. 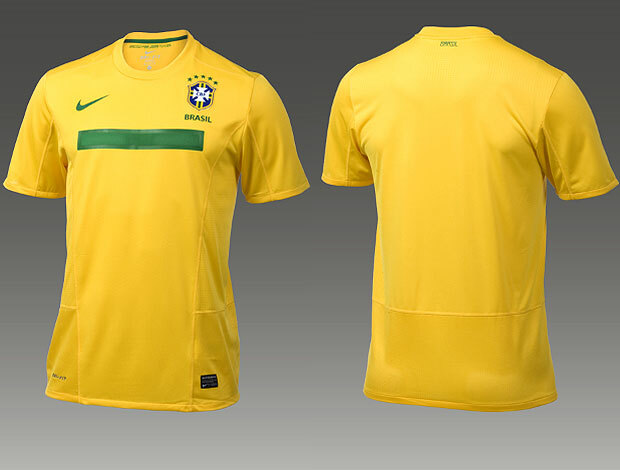 Some Brazilian native people paint their chests with horizontal bars using natural pigments, mainly red or black (it's inspiration to horrible and hated 2011 season nation soccer team kit: home, away, third). The number of stripes — four — is because, in 19th century, it was thought that there were four great native Brazilian "nations": Tupi-Guarani, Macro-Je, Arawak, and Carib. 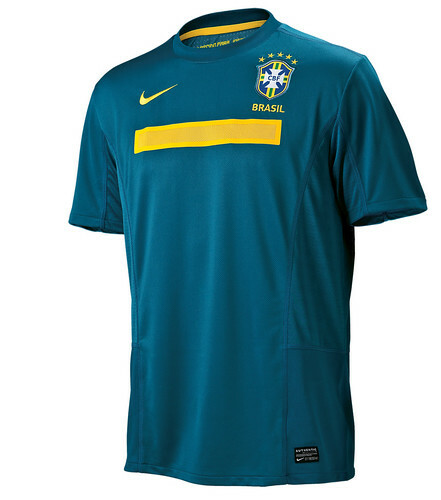 Let me explain it: stripes are Brazilian flag are still there, but in a more abstract representation. I don't know if it's clear, but inside the red stripes there're the black one; can you see it? It's purposely colorful, but, if in one way it looks complex, it could easily be drawn by a six-years-old child, by memory. 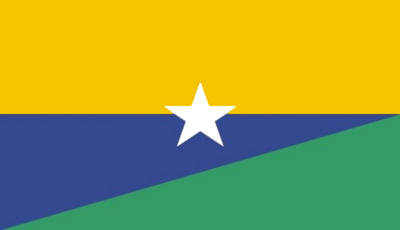 What's your opinion about this flag? Don't feel prevented from comment. I'm waiting a very special activity in this blog. Wait, it's coming soon. According to a Chinese law in effect since 1997, subnational entities, like cities and provinces, can't have their own flags, with exception of SARs (special administrative regions), apparently. 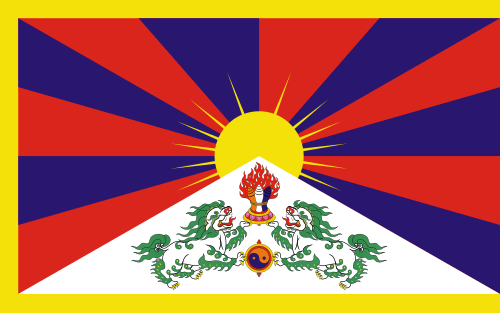 Some of main minorities in China, although, has historical or political flags to be identified with: Tibetans (Tibet), Mongols (Inner Mongolia), Manchus (Manchuria), and Uyghurs (Xinjiang, a.k.a. 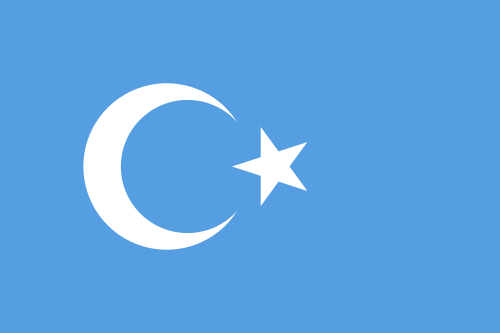 East Turkestan or Uyghuristan). It's not the case of Zhuang people, based in Guangxi Zhuang Autonomous Region. The sixteen-pointed (?) star seems to be a repeated theme in this copper drums, so it was used. 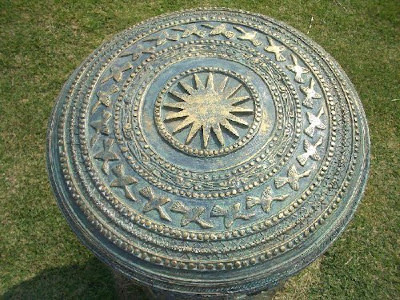 Dark green and orange was the chose colors, because they look like the one of copper, and because green, in Chinese culture, represents harmony and prosperity. I'd like to use red, that means south, but I hadn't the opportunity. I'm sad Indian and Chinese governments aren't friendly to regional flags, because I can see a great vexillological horizon to these parts of world. What's your opinion about the flag? Comments are greatly welcome!